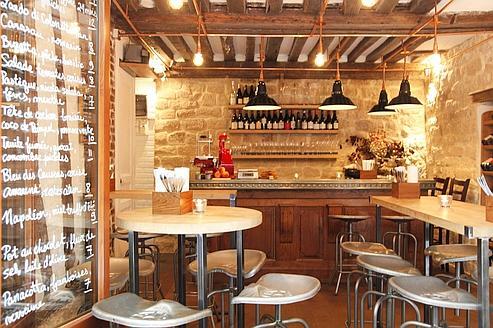 Frenchie Bar a Vins, " a superb annex to one of Paris hottest bistros." Ever since it opened in 2009, Frenchie, chef Gregory Marchand’s excellent contemporary French bistro in the rue du Nil in the Sentier, Paris’s old garment district and one of my favorite parts of the city, has been one of the toughest places in Paris at which to snag a table. The reason is that even though they’re lots of young chefs in the city who are doing produce-driven market menus these days, Marchand has a brilliant gastronomic imagination that continuously concocts dishes which are beautiful to look at, feature an intriguing balance between varying textures, and are deliciously original in terms of simple but unexpected constellations of taste. I’ve eaten at Frenchie dozens of times, but eagerly look forward to every meal for a new flourish of his nimble culinary wit and ingenuity. So it’s great news for anyone who’s hoping to sample Marchand’s cooking that he’s just opened Frenchie Ba a Vins directly across the street from his main restaurant. This new address does not take reservations, but serves on a first- come, first-serve basis and features a terrific small-plates menu that comes from the kitchen across the street and offers delicious cameos of Marchand’s talent. Meeting three friends for dinner the other night, we arrived at 7pm, when it opens, and quickly grabbed a small, high wooden table with four high stools with stamped-metal tractor-like seats that proved surprisingly comfortable during the five hours that we spent nibbles, sipping and gabbing. Some of the dishes on the menu at Frenchie Bar a Vins also appear on the menu at Frenchie–a sublime cured Banka trout from the Basque Country with cucumber curls, pickled onions, fresh herbs and a flower or two, while others are unique to the wine bar. Aside from the trout, my two favorite dishes of our long viniferous huddle were the brilliant tomato salad with fleshy black Basque cherries in white Balsamic vinaigrette with fresh croutons and the amusingly do-or-dare roasted pig’s head. Roasted pig’s head is what it rather cryptically says on the menu, which, to Anglophone ears conjures a slightly scary image of a whole pig’s head being brought to the table on a platter. But no, instead Marchand picks the rich meat out of the beast’s cranium and serves it with fresh navy beans, herbs, a hummus like sauce, and a vinaigrette, and it’s sublime. I loved the wine list here, too. Not only is it fairly priced, but it includes some really good summer quaffs, like a Loiber Reisling from Austria and an excellent Spanish white that evaporated too quickly for me to even make a note on my iPhone. This open-to-all-comers bacchanalia is the work of crack sommeliers Laura Vidal and Aurélien Massé, and it not only suits Marchand’s cooking to a T but pushes out the walls a bit by including wines from other countries, which is still very rare in France. Though this wine bar was conceived with the idea of making Marchand’s food more available to people who haven’t had the luck or perseverance to get a reservation at the original bistro, I suspect that it’s going to quickly become so popular that it too will become a tough place to get into to, especially since the service is charming and the space itself has such a comfortable, Williamsburg (Brooklyn) hip post-industrial vibe–suspension lamps, exposed stone walls and a short wooden service bar with stools. The other night, the international food Tom-Tom meant that the rooms was pretty much packed with eager Americans and other Anglophones, which frankly didn’t bother me at all. If many gastro scribes bemoan the presence of too many of their countrymen and women in Paris restaurants, my feeling is that those people who love food this much and are shrewd enough to have found this place before it gets an inevitably massive cyber shout-out are my kind of eaters. To note, too, is the fact that this is a great spot for anyone dining on their own and that there’s absolutely no turnover pressure here at all–at least for the time being. They’re also a couple of sidewalks tables on this small, stone-paved pedestrian night for al fresco dining on a hot night. Finally, after some four bottles of wine (gulp) and at least ten dishes, the bill for the four of us worked out to 40 Euros a head, which, as David noted, is a really good buy in a city where it’s become much too easy to leave a 50 Euro note behind for a decidedly less good casual meal (And FYI, two of us went home on Velib bicycles and the other two took the Metro, so we were obviously as well fed as we were well watered). So chapeau (hats off) to Gregory Marchand, and I hope he will take over the space next door and make this delightful wine bar bigger if the real-estate gods smile on him. 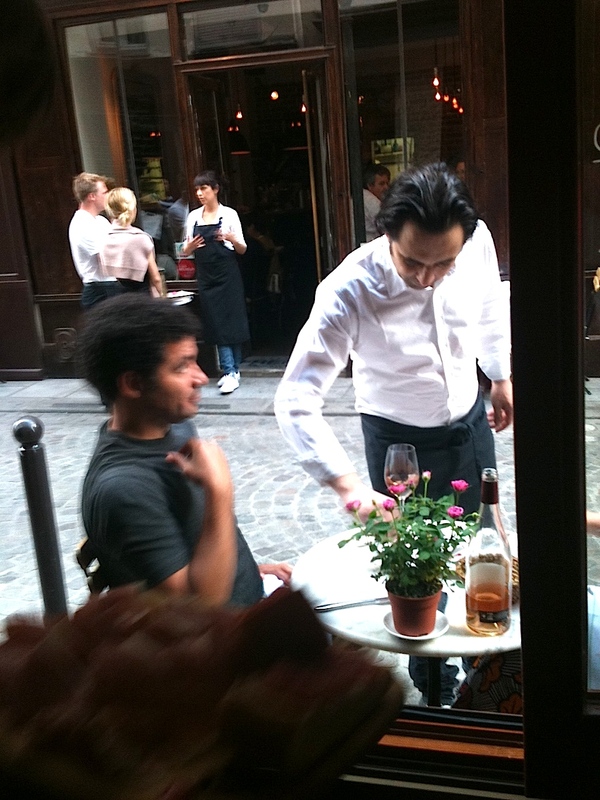 Frenchie Bar a Vins, 6 rue du Nil, 2nd, No Phone, Metro: Sentier, Open Monday-Friday, 7p.m.-10:30p.m. No reservations. Average dinner 35 Euros.